NOTE: Date must be in the form YYYY-MM-DD, like 2019-02-04. 2019-02-04 - Louisville, KY - Photo by Amanda Taylor. 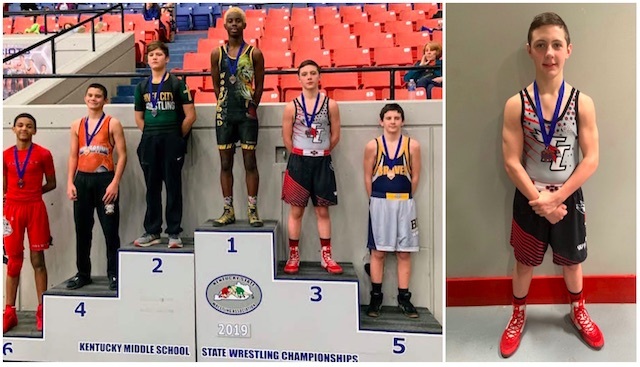 On Sunday, February 3, 2019, 13-year-old ACMS student Trayton Stargel wrapped up his final season with the Taylor County Youth Wrestling Program, when he traveled to Broadbent Arena in Louisville, KY, to compete in the Kentucky Youth State Wrestling Championships. There were 29 competitors from all across the state in the 130 pound weight class, and the top 6 medaled. Trayton finished out the state tournament with only one loss, bringing home a 3rd Place medal. Judy Carol Rhoads Huff, 62 of Columbia, died Monday, February 4, 2019 at TJ Health Columbia. The memorial service for Judy Carol Huff will be held at 1pmCT on Thursday, February 7, 2019, at the Bernard Funeral Home Chapel, 367 N. Main St., Russell Springs, KY, with Bro. Timo Kavonen officiating. Burial will follow in the Military Springs Cemetery. Visitation is requested from NoonCT until 1pmCT on Thursday. Russell County, KY - On February 2nd, 2019 at approximately 4:22pmCT, off-duty KSP Detective Nick Davis was in Jamestown, KY, when he observed a 1998 Honda come to an abrupt stop in the roadway, almost causing an collision. Detective Davis could hear a male screaming and a child crying inside the vehicle. Detective Davis made contact with the driver, 30 year old Justin Belt of Jamestown and noticed he smelled strongly of alcohol. Det. Davis identified himself, and asked Belt to step out of the vehicle. Belt attempted to run over Det. Davis with his vehicle and fled the scene. Troopers Zach Scott and Jon Carlock arrived a short time later and located the vehicle at a residence on Mann Rd. Troopers located Belt sitting outside the residence and arrested him without incident. Union, KY - The Kentucky Department of Parks are accepting bids for four bison at Big Bone Lick State Historic Site. Anderson, IN - The Lindsey Wilson women's indoor track and field team competed at the Anderson University Indoor Invitational on Saturday where they recorded nine total first-place finishes and three national qualifying marks. Paige Pettell won one event and was the top collegiate performer in another at the Invite. Frankfort, KY -. The Department for Public Health (DPH) is inviting school-age children across the Commonwealth to create and submit original artwork for a chance to win cash prizes in a tickborne disease prevention poster contest sponsored by the Northern Kentucky Independent District Health Department. "I am excited to announce this poster contest spotlighting tickborne disease because this is a serious health problem facing Kentucky families," said Jeff Howard, M.D., commissioner of DPH. "I encourage all students to participate in this poster contest on tick bite prevention and I am looking forward to seeing how our students address this important topic creatively with their posters. I also would like to thank the Northern Kentucky Health Department for sponsoring this poster contest." He co-owned and operated Weddle and LaFavers Chevrolet and Buick Car Dealership in Liberty for over 30 years. He was a Deacon, former Sunday School teacher and member of the First Baptist Church in Liberty. He has served on the Casey County Bank Board of Directors for over 40 years, currently holding the position of Vice-chairman. Funeral services will be at 12noonCT/1pmET Wednesday, February 6, 2019 at First Baptist Church with Bro. Jimmy Brown officiating. Burial will follow in the Glenwood Cemetery. Visitation will be held from 5-8pmET on Tuesday and from 9am-1pmET on Wednesday, both at the First Baptist Church. Husband, father, grandfather, mentor, friend, Columbia business owner and good Democrat - Adair County lost a major asset in Junior Stotts who passed away today after a brief illness. Details of his arrangements will be printed as soon as they are known. Please keep Connie and their children and grandchildren in prayers. Carol Fristoe's health was so bad she once passed out seven times in a single day. "I'd be walking and just pass out," she said. She was so weak she would wobble when she tried to walk. She couldn't get food to stay down. The whites of her eyes had turned red. "Every hospital I've been in the last 10 years said we have no doubt you're sick, but every test we run comes back normal," said Fristoe, 67, of Mayfield. Read the full article at mayfield-messenger.com. Washington County, KY - On February 2nd, 2019 at approximately 7:49pmET, Trooper Daniel Forbis was on routine patrol in the limits of Springfield on Hwy150 Bypass when he initiated a traffic stop on a 2000 Malibu for a registration violation. Trooper Forbis turned on his emergency equipment to initiate a traffic stop when the vehicle fled. The driver continued west on US 150 running a stop light at the intersection of KY 555, and made several turns on different roadways reaching speeds in excess of 100 MPH. The pursuit crossed in to Nelson County and back towards Springfield on US 150 when the driver sideswiped a vehicle while attempting to pass and lost control of his vehicle striking an embankment. Anderson, IN - The Lindsey Wilson men's indoor track and field program took home a host of victories at the Anderson University Invitational on Saturday. The Blue Raiders notched 10 individual victories as well as two team victories, which included four A-standards. On Thursday, January 31st, 2019, at approximately 11:28pmET, Trooper Jake Harper was on routine patrol in the limits of Campbellsville on US 68 when he initiated a traffic stop on a 2002 Avalanche for a speeding violation. As Trooper Harper made contact with the driver, 41 year old Efrain Duncan of Campbellsville, he noticed a strong odor of marijuana coming from the vehicle. Trooper Dexter Colvin arrived to assist and made contact with a passenger, 29 year old Dwayne Smith of Campbellsville. Trooper Harper performed a search of the vehicle and located digital scales, cash, and several small bags containing suspected controlled substances including marijuana, cocaine, heroin, and methamphetamine. Things in the Columbia Adair County Economic Development Authority (EDA) move slowly, as evidenced by the trip from inception to completion of Whayne Supply. After over four years - from being a thought to a prospect for a Whayne Supply location, to final selection of Columbia and through the building process - the business is now in completion mode on Dohoney Trace, Holladay Place, in New Columbia, KY.
By Calen McKinneyCampbellsville High School senior Elizabeth Sullivan received the overall scholastic award at this year's Kentucky Distinguished Young Woman program. Sullivan was also named to the Top 10 out of 30 participants. Police activity expanding due to a high ratio of vehicular crashes resulting in injury and/or death. Columbia, Ky. (February 3, 2019) - Kentucky State Police, Post 15 will be conducting safety traffic checkpoints in the Post 15 area, which includes Adair, Taylor, Green, Casey, Russell, Metcalfe, Cumberland, Washington, Marion, Monroe and Clinton. Troopers will be checking for impaired drivers, children that are not properly restrained in child safety seats and informing the public about the use of seatbelts. It's currently 46F at the Adair County Mesonet station. There's a 50 percent chance of showers this afternoon, mainly after 2pmCT. Increasing clouds, with a high near 65F. South wind 6 to 15 mph, with gusts as high as 25 mph. New precipitation amounts of less than a tenth of an inch are possible. Showers are likely tonight, mainly before 10pmCT. Otherwise, cloudy, with a low around 53F, and south wind 5 to 9 mph becoming light after midnight. The overnight chance of precipitation is 60%. New precipitation amounts of less than a tenth of an inch are possible. There is a chance of patchy fog after 4amCT. Tuesday will bring a 40 percent chance of showers. Cloudy, with a high near 68F. Southwest wind 3 to 6 mph. Adair County: No events Circuit Court. 101 events District Court. Green County: 1 event Circuit Court. 116 events District Court. Russell County: No events Circuit Court. 185 events District Court. Taylor County: 2 events Circuit Court. 145 events District Court. --Robert Stone, Monday, 4 February 2019.